This page includes The WFSC Announcements columns from the 2000 issues of Across the Fence Post. Trivia contest rules and questions will appear in the February issue of ATFP. Answer 20 questions and win $20 - that is, if your club has the most correct answers! The meeting will be held at the Ramada Plaza Hotel in Fond du Lac, WI. Anyone who is interested is invited to attend and is extended the right of discussion. Contact WFSC Secre-tary Karen Weigt if you'd like to be included on the mailing list for meeting details. HELP FOR YOUR SHRINKING MEMBERSHIP ON THE WAY! The WFSC has heard your pleas. In response, a WFSC statewide promotional program will be initiated for October National Stamp Collecting Month. The program emulates a publicity strategy that was highly successful in Japan. The WFSC will prepare a set of eight topical exhibit pages aimed at attracting the general public to philately. Participating clubs are asked to fill the spaces within the pages that call for readily available philatelic items. The completed pages, together with your own club promotional materials, are to be displayed at your local libraries, post offices, wherever space might be attained. One set of pages per club will be included with the September ATFP mailing. This year's topic is space, which complements the many new space stamps coming out this year. • WISCOPEX dealers who chose to support this event and our special WISCOPEX issue with their ads. See p. 9. • Dennis Lemke of University Avenue Stamps and Carl and Phyllis Ziesemer of Plainex Stamps for generous donations toward WISCOPEX 2000 youth activities. The WFSC very much appreciates the donation of items received from Krause Publications for WISCOPEX 2000 youth activities. If you want your show/bourse to appear on the list covering events through the summer of 2001, send details by no later than August 15, 2000, to: Karen Weigt, 4184 Rose Ct., Middleton, WI 53562-4339, (608) 836-1509, or e-mail karenweigt@cs.com. Include a contact name, address and phone number. James R. Johnson will serve as Central Region VP. Johnson is a member of the Central Wisconsin Stamp Club and proprietor of Wisconsin Valley Stamps. George Stolze Sr., member of the Northwoods Philatelic Society (Iron Mountain, MI), will take over duties of the Northeast Region VP. The flier will be updated and sent with the September issue of Across the Fence Post. If you want your show/bourse to appear on the list covering events through the summer of 2001, send details by no later than August 15, 2000, to: Editor Karen Weigt. Wayne Hassell, WFSC Member-at-large, for donating memorabilia foe the WFSC historical files. 2000 COVER EXCHANGE PROGRAM The WFSC is again sponsoring a nationwide cover exchange program in which all stamp clubs, philatelic organizations, and individuals may participate. This is an opportunity for clubs with leftover show, commemorative and first-day covers to reduce their inventory by exchanging them for different covers for use as club auction items, door prizes or gifts. To participate, send your covers and a 55cents SASE to: WFSC, P O. Box 1451. Waukesha. WI 53187. Nominations are now being accepted for the 2001 Wisconsin Philatelic Hall of Fame. The deadline is December 31, 2000. Qualifications required of nominees are: (1) contributions of a purely local club nature shall not be the sole reason for selection to the Hall of Fame; and (2) a deceased philatelist may not be nominated or considered for selection until three years after his/her death. The meeting will be held at Stevens Point, WI. Anyone who is interested is invited to attend and is extended the right of discussion. Contact WFSC Secretary Karen Weigt if you'd like to be included on the mailing list for meeting details. The exchange offer will expire October 31, with returns being made by mid-November. See the September 2000 issue of ATFP for details of exchange rules. Nominations are still being accepted for the 2001 Wisconsin Philatelic Hall of Fame. The deadline is December 31, 2000. For details of qualifications and nominating procedures see the September 2000 issue of ATFP or request information from Karen Weigt, Secy., WFSC, 4184 Rose Ct., Middleton, WI 53562. On October 12, the U.S. 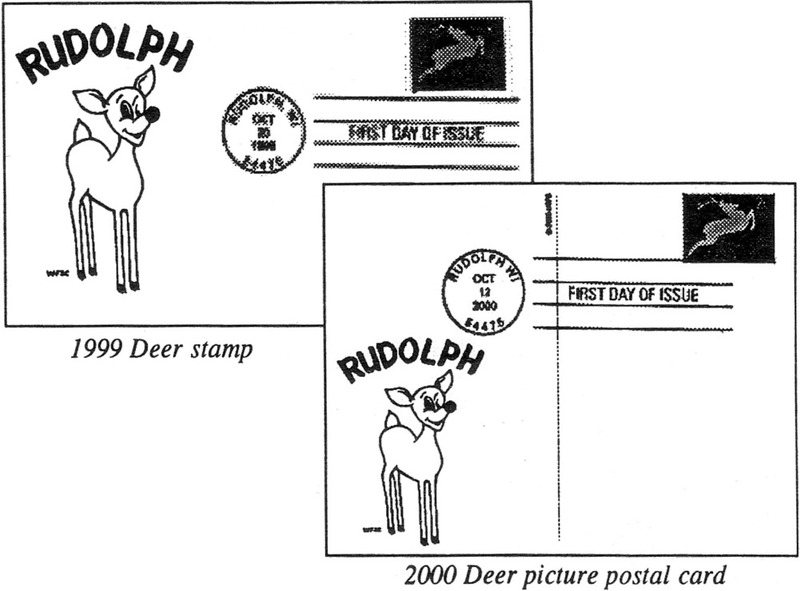 Postal Service quietly released the new Deer picture postal cards in Rudolph, WI. The WFSC has produced a limited number of these cards that include the First Day of Issue cancel and matching cachet used for its Deer stamp FDCs offered last year. To order by mail, send $2 each to: Deanna Juhnke, 3701 Jordan Ln., Stevens Point, WI 54481. Make checks payable to the WFSC. No SASE required.